If YOU don’t look out for you...who will? Learn how to protect yourself from the downside of our growing reliance on technological interaction. An Original Screenplay Optioned for Movie Development! The Raven of St. James’s Park is a fun, uplifting class-conflicted romantic comedy (and wonderful story of redemption) set in modern London. Internationally acclaimed life skill guide featured on coast-to-coast television and over 4,500 radio stations around the world. Ocean Palmer is the pen name of Denver-based author, speaker, and internationally known sales leadership coach Ted Simendinger. The pen name, he says, was born of necessity: “When your legal name is Theodore John Simendinger III, it takes a long time just to read a title page. Since its founding in 1991, Ted’s No Bats Baseball Club has raised and donated $1.6+ million to a wide variety of deserving charities. This fun and interactive program teaches why we worry, why heads get crowded, how the mind processes certain worries differently, and the smartest way to choose and manage what we worry about. You will also learn three quick ways to rid themselves of worrisome thoughts that do not belong in the Worry Circle. 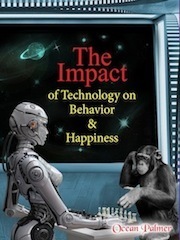 The remarkable, revealing truth about technology’s impact on attitude, emotion, and behavioral change in an increasingly wired and digitally dependent world.